CANDY STRIPE BRB's -Now TWO litters produced from the same pairing. BOTH with Super Candy Stripe babies!! ALBINO BRB's -07/14/2016 Bianca delivered an amazing litter with 3.4 Albinos and 5.7 het Albinos. All healthy full term babies. Click HERE to see available babies. 04/09/2019 - Updated BRB Breedings page with activity so far. 02/25/2019 - SURPRISE, Hershey delivered a litter of 15 baby BCI, Motley and normals with Pastel from both sides. I did not know she was gravid and her only shed during the breeding season would place babies due early April. 05/13/2018 - First BCI litter of 2018, a cool litter from TH Motley Snow x DH Snow. All eight possible phenotypes are in the litter, Motley Snow, Snow, Albino Motley, Albino, Anery Motley, Anery, Motley and normal. 24 total babies and almost dead on odds for each phenotype. 06/06/2017 Dee delivered a nice litter of 25 healthy babies, a nice mix of Hypo and Cyclone genetics in the pile. 05/30/2017 - Mariah delivered a sweet litter of 19 babies with an assortment of Motley, Hypo, Jungle and Monster Tail genes mixed into every baby. 02/16/2015 - Male Hypo Het Albino Colombian Rainbow boa from Finland available for sale. Our main objectives are to ensure that we supply only high quality animals and unparalleled customer satisfaction. or 408-224-0414 to purchase any of our animals. Brazilian Rainbow Boa pairings for 2018 are now up on the BRB breedings page. I introduced the males on January 11th and within the first couple of days I witnessed several wraps and one copulation. Great start to the 2018 BRB season. 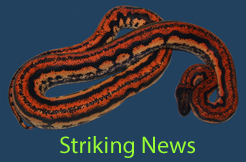 Check out the Brazilian Rainbow Boa Breedings page for details. Check out the Boa Constrictor Imperator Breedings page for details.